Maco Doussias trained with Yvonne Mounsey, Nader Hamed, and Margaret Hills at Westside School of Ballet. He danced in many productions over four years. In Spring 2004, he danced lead roles in Valse Fantasie and Serenade. 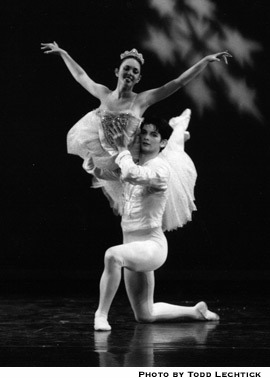 In Spring 2003 he danced the pas de deux in Yvonne Mounsey’s Classical Symphony. His roles in The Nutcracker included the male lead in Spanish and Snow Cavalier (2003). He also played character roles including party father and chestnut seller (starting in 2000). Maco danced with Columbia City Ballet (South Carolina) before joining the corps of Louisville Ballet for Fall 2005. In Fall 2006 he joined Los Angeles Ballet for its inaugural season. Maco returned to Westside Ballet as a guest artist in the 2006 production of The Nutcracker, dancing as the Sugarplum’s Cavalier.